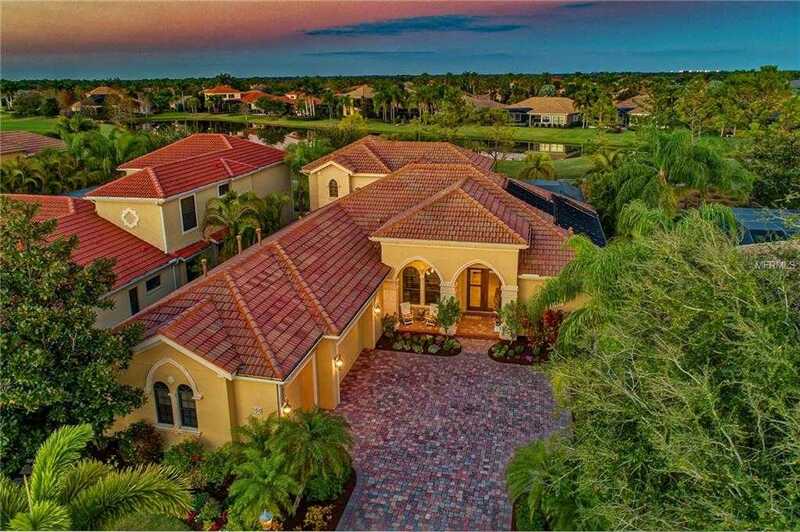 STUNNING- Gibraltar Athena III Plan Masterpiece Pool Home with Golf Course & Lake Views awaits the discerning buyer! The paved driveway has a 3-car side load garage and the front elevation offers beautiful architectural details. Upon entry your welcomed into the Grand Open space with Coffered ceilings, Crown molding throughout and a Picturesque view of the Waterfall Pool. The dining room features columns and arched decorative windows for elegant dinners. The Gourmet Kitchen offers custom cabinetry, granite countertops and a breakfast bar for entertaining or family gatherings. Featuring Stainless Steel appliances, gas cooktop, wall oven & microwave and a decorative cooktop hood. The fishbowl window is perfect for eating at while admiring the outdoor space. The master suite has wood flooring, trey ceiling and plenty of windows with entry out to the lanai. Enjoy the master bath with a soaking tub, large stall shower and double vanity. The 2nd bedroom has beautiful wainscoting detail & shares a jack/jill bathroom. The 3rd bedroom is spacious with plantation shutters for a elegant touch. The office with rich wood flooring and cabinetry, which can also function as a fourth bedroom. Venture upstairs to the bonus space for a perfect get-away, with built-ins and bathroom, you’ll enjoy outside in the screened in balcony overlooking the golf course & lake while sipping a glass of wine. The Lanai is a complete sanctuary with outdoor kitchen and breathtaking salt water heated pool/spa with drainage system. Please, send me more information on this property: MLS# A4426933 – $869,000 – 7029 Brier Creek Ct, Lakewood Ranch, FL 34202. I would like to schedule a showing appointment for this property: MLS# A4426933 – $869,000 – 7029 Brier Creek Ct, Lakewood Ranch, FL 34202.